Yesterday we had some fun making cobwebs and putting them onto blocks ready to be assembled into the Spiders Hanging by a Thread quilted wall hanging. Today we finish things up by creating our black spiders! Cut five 4½” squares of black fabric. Iron on the HeatnBond Feather Lite Iron-On Adhesive. Set one aside. Free hand draw an oval four different sizes. You can do it on paper first then cut out and trace onto the paper side of the adhesive, or draw directly onto that. These are going to be your spiders. Cut twenty four 3½” pieces of rick rack. These are going to be your spider legs. Taking one black spider, 6 pieces of rick rack and one cobweb block. Lay spider out on block and tuck 3 ends of rick rack under one side of spider and 3 on the other side. Press. Repeat for 3 more spiders. Stitch around the body of the spider securing the rick rack legs in place and attaching them to the block. Bend the rick rack as you stitch down each leg, creating bent spider legs. One block won’t have a spider. Sew the blocks together in a vertical row with the last or bottom block not having a spider on it. Sew the spiders onto the blocks and sew the blocks together. Leave the last block with no spider on it. For the fifth black fabric square, cut out the spider shape from that fused piece and cut the same shape out of another piece of black fabric not fused. Remove paper, sandwich together right sides out but do not press. Tuck legs into spider sandwich and then press creating a spider on its own. Stitch around outside of spider to secure legs. Kink the spider legs to cause a bend and stitch the fold in the rick rack to hold in place for each leg. Set this spider aside. 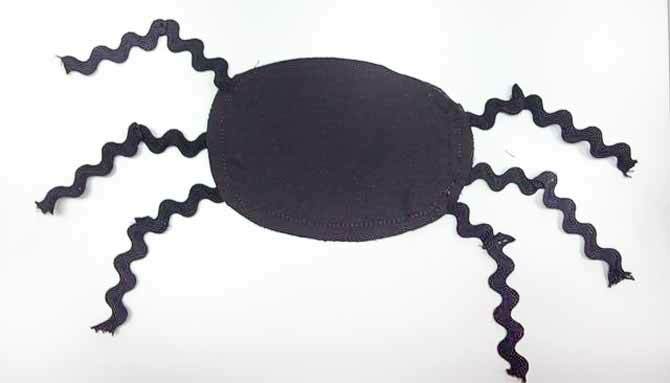 Stitch around body of spider and stitch bend in spider legs to hold shape. Pin backing and batting to top and get ready to quilt. Using black thread, quilt fun patterns in each of the spiders. Quilt in the background as well. I quilted by echoing the shapes of the cobweb. Put on the binding as well. On each spider add cute button eyes. I simply had to add polka dot buttons. Add some fun buttons for eyes on your cute spiders! On the last block stitch down a 10 – 12” piece of embroidery thread starting somewhere on the last cobweb and hanging down off the quilt, then attach to the back of the final spider. If you find it’s too flimsy, take a piece of cardboard slightly smaller than your spider and glue to the back of the spider then tape the piece of embroidery floss to it. Attach embroidery thread to the cobweb and then to the spider so he is hanging off the quilt. Sew a sleeve to the back. 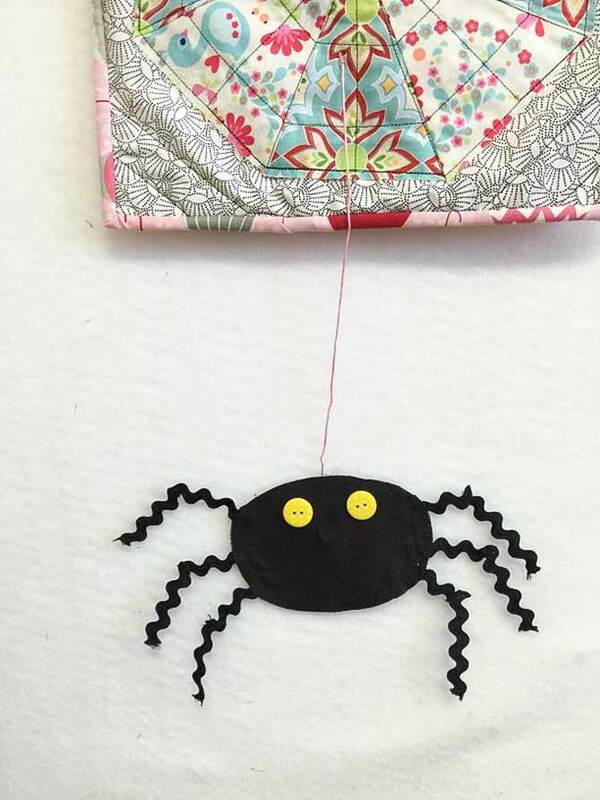 Hang your spider quilted wall hanging and get ready for the compliments to roll in!